What Is a Quadruple Meter? Western civilization devised a method to organize music to sound precise and ensure that each performance would be played exactly as the composer intended. That method was called meter, and one of the most commonly utilized meters is a quadruple meter. Many rock and roll songs, like the melody "Eleanor Rigby," by The Beatles, are played in quadruple meter. Hymns like "What a Friend We Have In Jesus" and "Holy, Holy, Holy" are in that meter also. The patriotic "Battle Hymn of the Republic" and "America the Beautiful" are in quadruple meter, as well as the Christmas songs "O Little Town of Bethlehem" and "O Holy Night." When Ludwig van Beethoven penned the fourth movement of his Ninth Symphony, the chorus known as "Ode to Joy" was written in quadruple meter. One of the earliest uses of quadruple meter was found in a Renaissance book of dances from 1460 for the keyboard and called the Glogauer Liederbuch. Bar lines and measures were not commonly used until the 17th century. Another means of indicating the dances were to be performed with musical notes in groupings of four must have been utilized. The tune to the Christmas favorite, "O Come All Ye Faithful," is in quadruple meter and was composed by John Francis Wade and put in his "Cantus Diversi" from 1751. The words are from the Latin hymn "Adeste Fideles." If a piece is in quadruple time, there will be four beats to each measure. For a piece of music with a time signature of 4/4 (simple quadruple meter), the 4 on the top of the time signature indicates how many beats there are to a measure, and the 4 at the bottom means quarter notes are each one beat in duration. For a piece of music with a time signature of 12/8 (compound quadruple time), there are 12 eighth notes per measure, arranged in four beats with three eighth notes to a beat. You can recognize if a musical piece is in triple meter or quadruple meter by tapping your foot or clapping your hands to the beat. If the piece has a metrical pattern like a waltz, it is in triple or 3/4 meter. Quadruple meter has four beats per measure. The first and third beats are the strong beats and the second and fourth beats are weaker. The first beat is the strongest beat in the measure. You should be able to say, "One, two, three, four" in time to the music. Marches may sound like they might be in quadruple meter but they are actually in what is called cut time or duple meter with two beats to every measure. 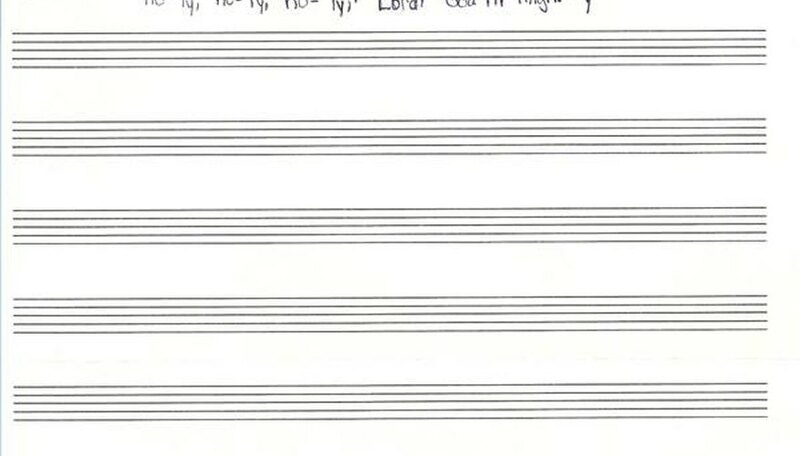 Another way of telling if a piece is in quadruple meter is to listen for the emphasized words in the song. The most important word in a lyrical phrase often falls on the first beat, and if three syllables with weaker accents follow before the next important word appears in the phrase, you can be sure the piece is in quadruple meter. For instance, in the first phrase to the song "O Little Town of Bethlehem," the first full measure contains the words "little town of," the second full measure is "Bethlehem, how," the third measure is "still we see thee," and the last measure is "lie," with the last beat being the first syllable of the word "above," which begins the next phrase. The word "little," "Bethlehem," "still," and "lie" are the most important words in that phrase. The words "town" and "see" are on the third beat, which is also a strong beat but not as strong as the first beat of the measure. "Of," "how," "we" and "thee" are all on the weakest beats of the measures. Quadruple meter is used extensively in Western music but not as much in music from the East. Gregorian chant and many Oriental music forms are ametrical, meaning there is not an established metrical beat. The symbol which looks like a capital letter C is sometimes used to show quadruple meter. Many people think the C is an abbreviation for "common time," another name for quadruple meter. The C is actually an old form of time notation from the 15th and 16th centuries and symbolizes tempus imperfectum, or an incomplete circle. The C from that time period actually corresponded to the modern 2/4 rather than 4/4 time. For almost four years, Sandra Petersen has written fiction stories and non-fiction articles for sites like FaithWriters, Associated Content, Helium, Textbroker, and Triond as well as Demand Studios. Petersen attended the University of Wisconsin-Superior and earned her Bachelor's degree in elementary education with a minor in music education.